Bring a fresh, traditional look into your bathroom with this vanity. Its white ceramic counter and white particle board base are very easy on the eyes. With a double-door cabinet, this vanity can hold all your bathroom must-haves. This classic set from Magick Woods will make your bathroom look brand new. Use this vanity to bring more modern style into your bathroom. Made with a roomy double-door cabinet and drawer, this vanity has lots of room to keep items like toothpaste, towels, and hair brushes. Add a classic feel to your bathroom with this simple vanity set from American Imaginations. If you want a vanity that is both stylish and useful, this modern vanity is perfect. The double-door cabinet and drawer are great for putting away bathroom items. This simple vanity set from American Imaginations will fit right into any bathroom decor. Keystone 24-inch W 2-Door Freestanding Vanity in White With Ceramic Top in White Bring a fresh, traditional look into your bathroom with this vanity. Its white ceramic counter and white particle board base are very easy on the eyes. With a double-door cabinet, this vanity can hold all your bathroom must-haves. This classic set from Magick Woods will make your bathroom look brand new. 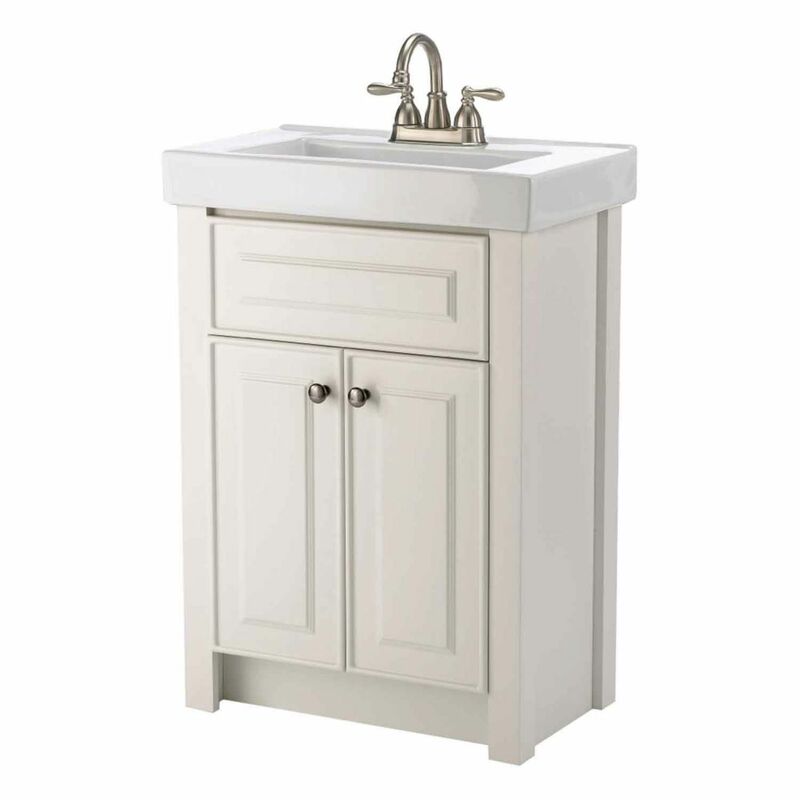 Keystone 24-inch W 2-Door Freestanding Vanity in White With Ceramic Top in White is rated 4.9 out of 5 by 9. Rated 5 out of 5 by George from Looks Great, amazing value! Bought this online, and it looks even better than I thought it would. Great quality, and just the right size. Wood is really nice quality, and detail, and sink is slight raise on the back is perfect. Customer service by the maker was really good, as I had a minor issue and they resolved it right away. Rated 5 out of 5 by daveonscugogpoint from Love this sink/vanity Looks great and fits nicely into small bathroom. No backsplash on sink, but two rows of 3" subway tiles serve purpose and look great. Rated 5 out of 5 by Kris from Lovely cabinet I love this little cabinet! Looks great and is small enough to fit in a small bathroom but big enough to have s nice amount of storage under the sink!! Rated 4 out of 5 by cjacks04 from Looks Great Nice compact vanity and sink. Looks great in our small powder room. For the price this was the nicest vanity/sink we found. Quality is quite good. Rated 5 out of 5 by Vromance from Substantial yet compact It's been installed fo a few weeks now and functioning very well. Perfect size for my small powder room. Rated 5 out of 5 by mombo333 from VERY NICE SINK!! Very satisfied with this sink. The price is right and is exactly as it is described in the product outline. No surprises, no fuss to muss to install. Hi, I want to install under cabinet heating that&rsquo;s in the toe kick. &nbsp;What are the toe kick dimensions? In the listed specifications it says the depth is 14.5&quot;, yet someone asked what the depth is and you answered that it's 121 3/4&quot; (which, I assume you meant to type 21 3/4&quot;). So which one is correct? Does this vanity have a backing to it or is completely exposed? Hi There, Good Afternoon...!! Yes it has backing and not completely exposed. Thanks, Magick Woods CS Team. what is the depth on this vanity and does it come with the faucet? Hi, The Depth of the Vanity is 121 3/4&quot;, and it comes without Faucet.